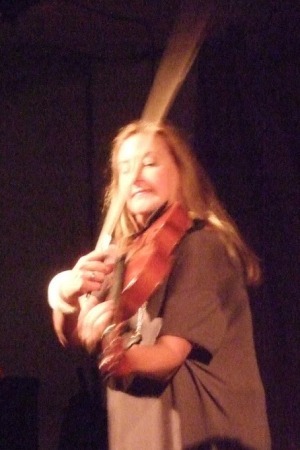 Mary Oliver (violin, viola, hardanger fiddle) was born in La Jolla, California, and studied at San Francisco State University (Bachelor of Music), Mills College (Master of Fine Arts) and the University of California, San Diego where she received her PhD in 1993 for her research in the theory and practice of improvised music. Her work as a soloist encompasses both composed and improvised contemporary music; she has premiered works by among others, Richard Barrett, John Cage, Chaya Czernowin, Brian Ferneyhough, Joëlle Léandre, Liza Lim, George E. Lewis, Richard Teitelbaum and Iannis Xenakis. Oliver has worked alongside improvising musicians such as Han Bennink, Mark Dresser, Cor Fuhler, Jean-Charles François, Tristan Honsinger, Joëlle Léandre, George E. Lewis, Nicole Mitchell, Andy Moor, Misha Mengelberg, Evan Parker, and Anthony Pateras. As a soloist and ensemble player, she has performed in numerous international festivals including the Darmstädter Feriendurse für neue Musik, Donaueschinger Muziektage 2002, Bimhuis October Meeting, Vancouver and Toronto Jazz Festivals, Ars Electronica, Ars Musica, London Musicians Collective Festival, Münchener Biennale, Salzburger Festspiele and Maertz Musik festspiel in Berlin. In 1994, she was an artist in residence at Akademie Schloss Solitude in Stuttgart where she added, through their generosity, the hardanger fiddle to her instrumentarium. For the past twelve years, she has been based in Amsterdam where she has worked locally and internationally with various ensembles such as Instant Composer’s Pool (ICP) Orchestra, Magpie Music and Dance Company, AACM Black Earth Ensemble, Scapino Ballet, Elision Ensemble, MAE, Het National Ballet and Xenakis Ensemble. Currently she teaches at the Hogeschool voor Kunst, Media en Technology and a member of ICP Orchestra, Ammü (with Han Bennink on drums, Johanna Varner on cello and Christofer Varner on trombone) and Magpie Music Dance Company. Recent projects include the 6th Room with light designer Ellen Knops and dancer Michael Schumacher, Trio! with clarinetist François Houle and contrabassist Torsten Muller and a duo Jomo with cellist Johanna Varner.